Minnesota's largest newspaper argued Rep. Ilhan Omar (D., Minn.) has not shown "change or personal growth" in the wake of her latest controversy over tweets widely condemned as anti-Semitic. "Getting attention does not equal effective leadership. That is a reality that U.S. House Rep. Ilhan Omar urgently needs to grasp as she settles into her new role representing Minnesota's Fifth Congressional District," the Star Tribune editorial board wrote on Monday. The editorial board noted Omar's latest tweet controversy came less than a month after the newspaper criticized her for spreading conspiracy theories about Sen. Lindsey Graham (R., S.C.). Omar also ultimately admitted last month that a widely-criticized tweet of hers from 2012 was "offensive." She had for months defended the tweet, which claimed Israel had "hypnotized the world" while doing "evil." "With an apology comes the expectation of change and personal growth. Omar's two tweets from the past weekend made it clear that hasn't happened. The flippant tone of one of her statements also underscores doubts about her judgment, particularly when this latest communications crisis could have been easily avoided," the editorial board added. The editorial called Omar's apology for her latest tweets, in which she suggested the financial clout of the pro-Israel lobbying organization AIPAC was responsible for Republican lawmakers's support for Israel, "grudging." "Minnesota's largely urban Fifth District needs a hardworking representative who can articulate constituent needs and pass legislation. The continuing controversies will make it hard for Omar to enlist the congressional colleagues she'll need to get the work done," the Star Tribune wrote. On Sunday, Omar quote-tweeted a tweet by liberal journalist Glenn Greenwald, who was criticizing House Minority Leader Kevin McCarthy (R., Calif.) for threatening to punish Omar over her comments on Israel. "It's all about the Benjamins baby," Omar's tweet read, with musical notes, referring to $100 bills. Forward opinion editor Batya Ungar-Sargon asked her to clarify who is "paying American politicians to be pro-Israel." Omar responded, "AIPAC!" 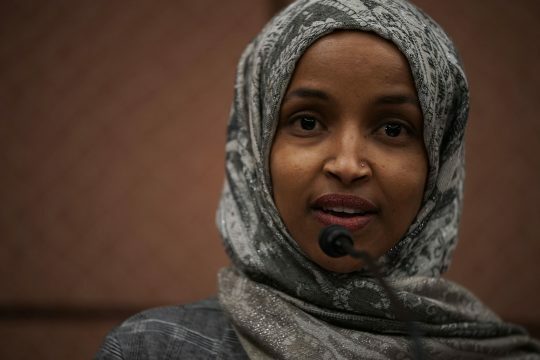 Among those who condemned Omar were Democratic and Republican lawmakers; Dan Shapiro, former U.S. ambassador to Israel during the Obama administration; and Jewish organizations. "Add the Star Tribune Editorial Board to that list," the board wrote. This entry was posted in Politics and tagged AIPAC, Anti-Semitism, Ilhan Omar, Israel. Bookmark the permalink.